Phnom Penh, 5 Dec, Abnews: Prime Minister Sheikh Hasina today put emphasis on increasing connectivity and cooperation among the Asian nations for the interest of the people of this region. The prime minister expressed the views when former Cambodian prime minister and President of Funcinpec, a Cambodian royal party, Norodom Ranariddh paid a courtesy call on her hotel here this morning. After the meeting, PM's Additional Press Secretary M Nazrul Islam briefed reporters. He said the two leaders discussed the issues of boosting regional connectivity and the people-to-people contact among the Asian countries. The prime minister said Bangladesh could work as a bridge between the East and West. "That's why we've taken an initiative to build a new international airport near Dhaka," she said. She said the Cox's Bazar Airport will be turned into an international airport to increase connectivity between Bangladesh and southeast Asian nations. Norodom Ranariddh, also the half brother of the current Cambodian King, expressed gratitude to the prime minister for naming a road in Dhaka after the name of former Cambodian King late Norodom Sihanouk. The prime minister thanked the Cambodian government and the people for naming a road in Phnom Penh after the name of Father of the Nation Bangabandhu Sheikh Mujibur Rahman. 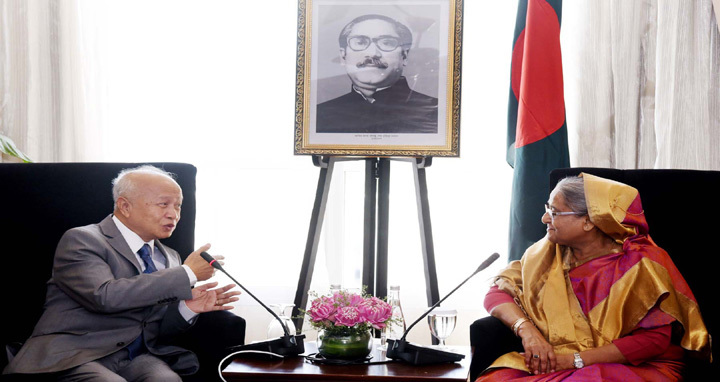 Sheikh Hasina and Ranariddh, a former president of the National Assembly of Cambodia, recalled their previous meetings held on different occasions including the conference of parliamentarians of Asian countries in Dhaka.